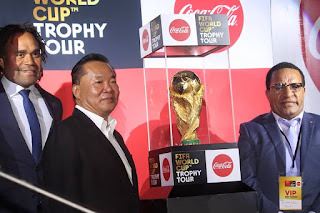 PNG Football Association has described the tour of the FIFA World Cup original trophy by Coca-Cola to Papua New Guinea as an inspiration and motivation for the sport in the country and players to raise standards of the game. “We must work together to achieve our dreams in football to one day qualify for the FIFA World Cup in the future, “ said President David Chung. The FIFA World Cup trophy arrived in Port Moresby yesterday and was welcomed by official sponsors Coca-Cola PNG and PNG Football Association officials. President Chung said PNG is privileged to have been selected to receive the trophy on a day’s tour and this marks a milestone for PNG Football to host the trophy and will go down in the history of the country. FIFA Ambassador Christian Karembeu who arrived with the World Cup trophy said PNGFA must start implementing programs for the grassroots for the development of football in the country and the Pacific. “The tour of the historic FIFA World Cup trophy to PNG will definitely inspire youths in this part of the region to be more involved in the sport,” said Karembeu. He said football fans deserved to experience and see the trophy. “The journey of the World Cup trophy is a piece of history of our football, our environment, our tradition, and belongs to everyone who dream and love football”, he said. 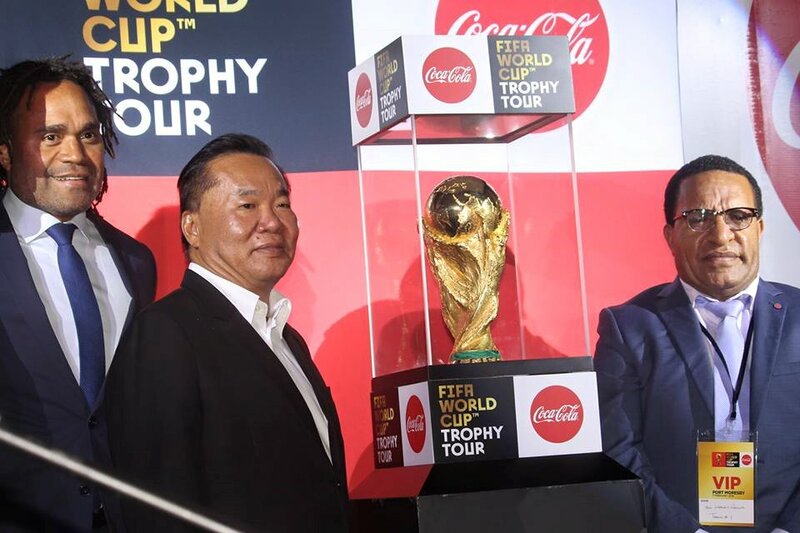 Coca-Cola PNG General Manager Joyonto Chaudhury said the tour of the trophy to PNG was their way of bringing excitement to football fans in the country.